If you’re readying this it means you now have or are about to bring home a new puppy. It’s a time of excitement and fun, but also I time of preparation and planning. Along with your new little fur ball, you’re going to need some supplies to keep him healthy and happy. I know it can be a bit overwhelming, with the unbelievable quantity of stuff that’s available out there, so I wanted to provide you with a complete guide to what you need to start you and your pup off right. There’s lots you could buy for your new puppy, but so much you don’t necessary need (especially not right away). You shouldn’t waste your money on unnecessary items now – save that for training (which is something that just about every puppy and person needs). So here’s my list of what you should have on hand from day one with your new pup. You can also download a printable PDF checklist below. A crate is a must for a few reasons. 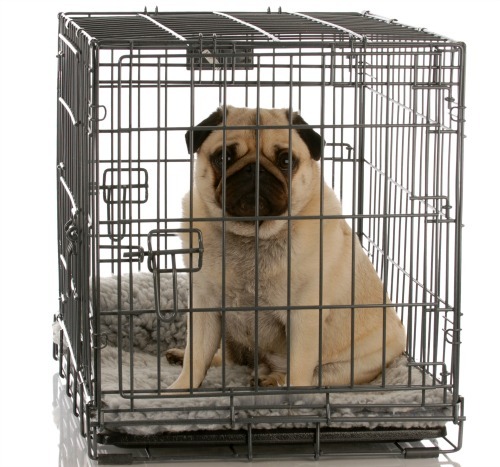 First off, let me assure you that putting your dog in a crate is not a negative thing (at least not if we do it right). If we done properly, your puppy should love his crate. Dogs are natural denning animals and innately have the desire to keep their den clean and not to pee or poop there. So that makes the crate the best tool for house training (click here for my complete post on house training). Your new pup didn’t come pre-loaded with the knowledge that he’s supposed to go to the bathroom outside and he has no urgency to hold it in you house – but he does in the crate (aka his den). There’s also a lot of trouble he can get into running around your house and you need a safe place to put your puppy when you can’t supervise. So the crate will become your money spot where you can leave him and go take a quick shower or run some errands. The size of the crate depends upon the size of the dog. For house training purposes we want the crate to be nice and snug – just bigger than the dog. Roomy enough for him to stand and turn around but no larger. Not too big that he could comfortable pee in one corner and sleep in the other. Since your puppy is probably going to get bigger you should get a crate big enough to fit him when he’s full grown so you won’t have to buy another. I recommend getting the generic wire crates that come with a divider (very important) so that you can make is small and expand it as your puppy grows. You hopefully know that you’ll need to give your dog food and water, so you’ll have to get bowls for each. I highly recommend stainless steel bowls for at least water but I like them for food as well. Ceramic and plastic bowls can be a home for bacteria which can cause some health issues. Stainless steel bowls will keep your dog fed, hydrated and feeling good – and will probably last forever. If you’re feeding a raw diet or wet food you should wash the bowls after each meal. If you’re feeding dry you could get away with a few days but don’t let them go too long. Also remember to clean the water bowls every couple of days or they can get funky. You’re puppy is going through some pretty big life change right now – new place, new family, new everything. So let’s not change more stuff on the little guy – if you can, keep feeding him whatever he was being fed before you got him, even if it’s crap food. Let him get adjusted to his new surrounding and family before you go messing with his diet. Then after 3 – 4 weeks when he’s used to his new environment, you can transition him to a new food. 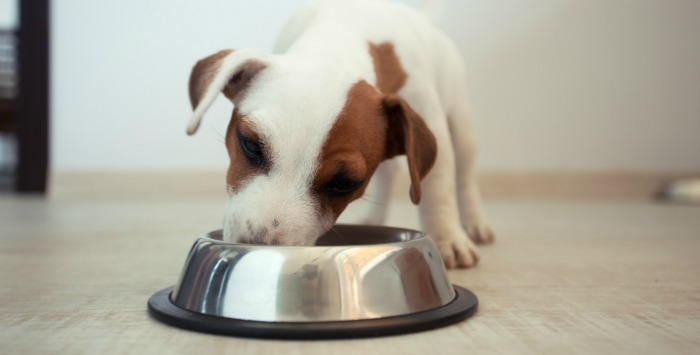 Many foods have puppy formulas but it’s not always necessary. If you’re feeding a good quality all life stages food they can get the same recipe as adults (just check the packaging for feeding guidelines). I believe that a raw diet is the highest quality for dogs (click here to listen to my podcast about good food choices) but also like grain-free dry foods as well. Look for quality ingredients that you recognize and can pronounce with little or no preservatives. Feeding a good, quality diet may cost you a little more now but will save you thousands of dollars in vet bills over the years. Don’t skimp – it’s well worth it. I recommend feeding puppies 3 times per day until they are about 6 months of age, then switching to 2 meals. The exception is with very small toy breeds who need to eat more frequently. If you’re listening to me (and I hope you are) than you are putting your puppy to sleep in his crate overnight. You can put a comfy padded flooring in but beware he may just see it as a fun toy to destroy. You might want to start by just putting in some towels or and old blanket to see if he sleeps on it or chews it into a million pieces. If he does chew on it than I would take everything out of the crate and let him sleep on the plastic floor. I know that sounds cruel, but trust me he’ll be just fine. You don’t want to leave him with something he could chew apart and swallow. He’s not always going to be in his crate though. You’ll want to get him acclimated with living in your house as well so you’ll need a bed for him to snooze on when not crated. There’s a wide variety to choose from so you’ll have to see what kind you and your puppy like best. I would get one that your dog will fit in when he’s full grown, even if it’s huge now, so you don’t have to spend that money twice. Let me fill you in a little secret: the only thing on your puppy’s agenda (no matter how old or what breed) is play. Play, play, play – 24/7. And if you don’t have appropriate things for him to play with, he’s going to find something to keep him busy (like your shoes, carpeting, sofa, fingers…). Every puppy has different preferences so you’ll have to experiment with a bunch to see what your little fur ball likes best. Everything from balls, rope toys, squeaky, stuffed and more. Get a variety of toys, let him go at them for a few days and then double down on his favorites. I like to have a few toys on the floor at all times so he always has an appropriate toy within reach. I also recommend having a few toys stowed away somewhere out of sight. Then after a week or so rotate some new ones in and put the old ones away for a while. This keeps the toys fresh and exciting for the little guy so he doesn’t get bored and lose interest (and gain interest on your curtains). 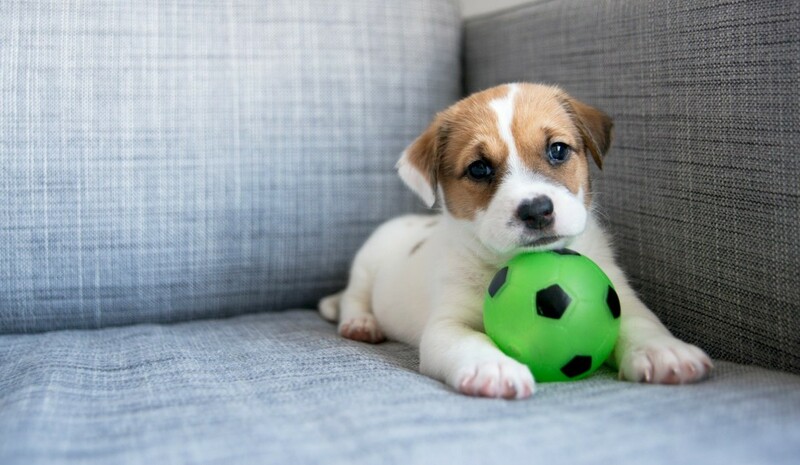 You can also save your puppy’s absolute favorite toys for the crate. Only give him those special toys in there so he’ll be happily occupied when you have to put him there for a bit. One toy I think is a MUST for every single dog on the planet is a Kong. The Kong company has come out with a wide variety of toys now (and most are really cool) but I’m talking about the original Kong toy. Now this toy may not look like much and if you use it as is it’s only mildly interesting. However, if you stuff it with some yummy stuff it becomes the greatest dog toy ever invented. 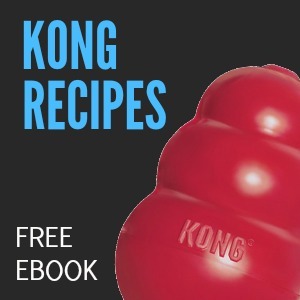 If you want some ideas of what to stuff your Kong with get my FREE eBook of recipe ideas and start experimenting. I think I kind of already broke the news to you that your little pup is going to grow bigger (some seemingly by the minute) so I don’t recommend you go out and buy that high end leather collar with all the bling bling you’ve had your eye on because he’ll be growing out of it in no time. Instead just get a cheap nylon collar and leash to start with and you can upgrade to something better as soon as your puppy get’s larger and/or reaches his full size (typically at around 10 months). If your puppy is young and/or a small breed I suggest getting a thin, light collar and leash. Keep in mind that your pup is tiny and had never wore a collar or been on a leash before. Those metal clasps can be kind of heavy for a little guy like him and be a bit uncomfortable. I would also not put on any identification tags just yet. They can also be a bit too much to get used to in the beginning. Get them but don’t put them on until your puppy is used to wearing the collar. You want to keep the collar and leash as light and low profile as you can to start out. Then once he’s used to the sensation of having it around his neck and walking with the leash attached and grows a bit you can try him in something more substantial. The same holds true for harnesses. In addition to toys, you’ll want to have some other stuff to keep your dog’s chompers busy and off your flesh. 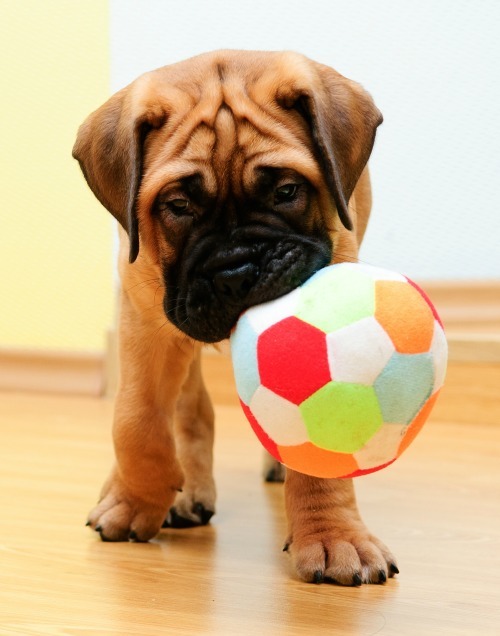 There’s lots of great chew toys and bones that will keep your puppy happily occupied throughout the day and his life. Bully sticks and tendons are great natural things for you puppy to chew on. NO RAWHIDE – rawhide bones of any kind are bad for your dog and can be dangerous toy our new puppy (read more in this post). Just use the bully sticks and tendons in moderation because they can be a bit rich and can sometimes cause some diarrhea if he eats too much. Just give it to him for short periods, always taking it away after. Because they are high value and very motivating it’s also a great thing to give in the crate to keep him happy in there. Whatever you give him to chew on, you should always supervise him at first and take it away when it’s only about an inch or two long so he doesn’t swallow it whole. Another great natural choice is an antler. They are a bit expensive but will last just about forever so are well worth the investment. Hopefully you’re going to be training your dog on how to live in this very strange human world and the best way to do that is by rewarding him for doing good things. Since you may be doing training often each day, I prefer to use treats that are small or can be easily broken into bite-sized pieces. We need to motivate him and get his focus, which can be tricky since most puppies are easily distracted, so I recommend using treats with a lot of scent (the more they stink, the more your dog will like them). Hard biscuits may work sometimes but when your pup’s in a very playful mood or there are some distraction around, they will be pretty useless (and they are a pain to break up). Soft, meat based treats typically work best. I like them to be about the size of a pea – we don’t want that little guy plumping up like a sausage – so if you get bigger one’s just break them up accordingly. I also like to use freeze-dried liver (my favorite training treat of all time) because it’s doesn’t need to be sealed up tight, will last forever, only has on ingredient (liver) and is very motivating (it’s like doggie crack). Although the pieces tend to be a bit large for puppies, they can usually be broken up well enough. Let’s face it poop happens. And with a puppy it will be happening quite a bit. If your puppy is eating dry food he will typically poop one more time than the number of meals he has. So, if your pup is eating three meals a day, he will most likely be leaving four deposits in your yard (every dog is different but that’s the average). Since you don’t want your yard to be a mine field and you don’t want to leave all that stuff around the neighborhood (don’t be that guy/girl), you’ll need to clean it up. Yes, you could just use any bags you have lying around but think about it: 4 poops a day, 7 days a week, 4 weeks a month … you’ll be going through 112 bags per month. Do you really have that many bags lying around your house? Also, let’s try to be environmentally conscious here as well – that’s a lot of plastic waste we’re talking about. It would be so much better for you and the world if you had a easy to transport and Earth-friendly option to do your poop removal activities. Well, lucky for us someone thought of that and created biodegradable clean up bags that come you can buy in bulk. These babies are a must for the responsible dog parent (and I know that’s you, right?!). These bags typically come with a nifty little case you can clip onto your leash so that you’re never left out in the field empty handed. As an added bonus many brands are even pleasantly scented so your walks back to the house with a full loaded bag are less disgusting. When poop happens – and it will – it’s best to be prepared. There you have it. Everything you’ll need to get going with your new puppy. Sure there’s plenty more that you may want (I know you’ve got your eye on that “I Bark At Ugly People” puppy t-shirt) but this will take care of just about everything you’ll really need to make your puppy happy. You can find all of this stuff on Amazon.com or at most local pet stores. I’ve also created a handy Puppy Supplies Checklist that you can download and print out – just enter you name and email in the box below. Congrats on your new furry best little buddy. Enjoy every single day with him.